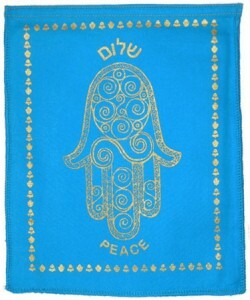 This unique set of flags will bring beauty and blessing to your home, classroom, synagogue, or sukkah. The banner is composed of seven individual flags, each reflecting a key Jewish value; its color and design is inspired by ancient Jewish tradition. Additional information about the inspiration for and design of the Jewish Blessing Flags is available on our website. Can be purchased online at Shalom House’s online store and the Sukkot Project. We are hoping that Ten Thousand Villages will be adopted retail and wholesale sales of this product in 2019.